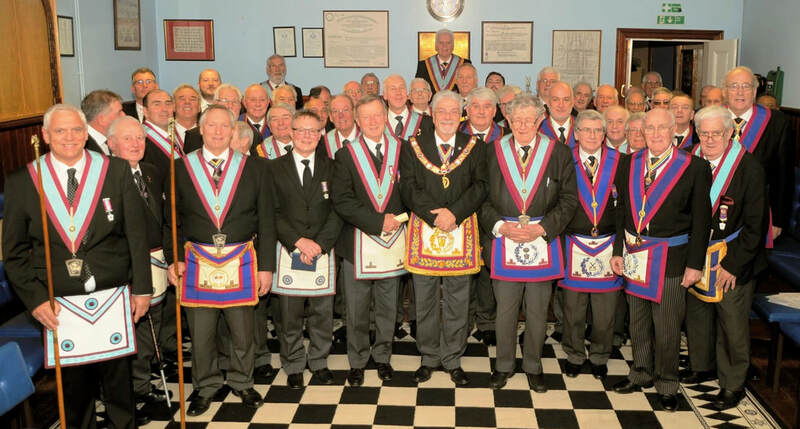 In celebration of their 50 years since Consecration, the Provincial Grand Master was delighted to attend the Wyven Mark Lodge, No.1333 escorted by the Provincial Grand Director of Ceremonies and attended by a number of Acting Officers. The Mark Meeting was preceded by their RAM, a relative whippersnapper having been Consecrated in 2012. It was their Installation meeting and a fine team effort, with many members supporting the Commander. Bro. Michael Kropidlowski was Installed as the new Commander. We wish him good luck. With the Mark meeting opened, the Provincial Grand Master was received, along with his Provincial Officers, to acclaim. As is his custom he accepted the Gavel and took the Chair. Having introduced his Officers, he requested the provincial Grand Secretary to read the Warrant of the Lodge. He went on to address all the Brethren on the purpose of the meeting. Tuesday the 23rd May, 1967 saw the Founders and the other Brethren gather for the Consecration and, at the end, the Wyven Lodge, No. 1333 was in existence. The oldest member is V.W. Bro. Brian Heasman who was Advanced in April 1974 who must have known the original members well. The Jubilee Warrant was read authorising the Brethren to wear the appropriate jewel. The Lodge was returned to the Worshipful Master, in this case the IPM, W.Bro. Bob Needham in the unavoidable absence through illness of the WM. Brother Timothy Kearton was admitted and Advanced to the Degree of Mark Master Mason in another fine performance by a team of officers, congratulations are due to them all. All those present finally retired to an excellent four course festive board, enjoyed an ample raffle and were grateful recipients of a set of four decorated glass coasters. The PGM with V.W.Bro. Brian Heasman (to his left) and W,Bro. Bob Needham and Brother Timothy Kearton (to his right) along with members and guests of Wyven Lodge.